Neuro Video is a thirteen track live CD, recorded at The Luminaire in London, on the 24th of November, 2007. 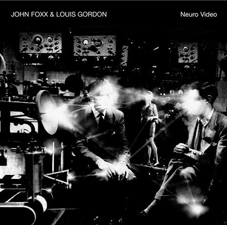 Another release with outstanding artwork, Neuro Video is typical of John Foxx live albums - in that neither the cover image or the name give any indication that this is actually a live recording. The sleeve artwork is an updated version of one of the original album cover concepts for The Pleasures of Electricity (a section of that original design can be seen inside the booklet), and continues throughout the booklet. No live shots, no text, just pure Foxx imagery. Having played the whole of Metamatic live earlier in 2007, this show saw the opportunity to put those tracks aside, and unearth many forgotten gems, so the concert's setlist is surely an interesting one, pulling tracks from all aspects of Foxx's solo career, which includes premier performances of "Shadow Man" and "Concrete, Bulletproof, Invisible" from Shifting City. Limited to just 1000 pressings, this album is a must for the true fan. It's unlikely you'll hear old favourites such as "Europe After the Rain" or "Dancing Like A Gun" played live often - if ever again - so grab Neuro Video while you can.